The familiar sound of a crisp clicks as you stand on one side, clutching your resin sombrero, as a few drops of sweat slowly trickle down your wrist. 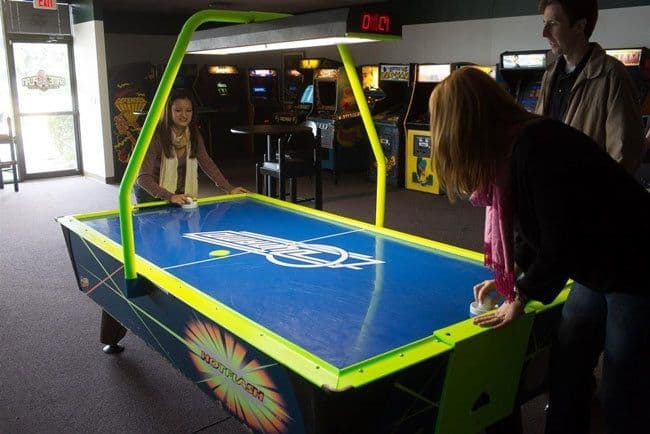 However, there is no time to wipe as those 7 seconds of anticipation are slowly over-shadowed by the exact same sound at the other end of the table, while your eyes follow the path that air-hockey puck takes, crouching in a goal-tending stance, defending your territory. The rush and excitement that follows that loud smack of first contact could be compared to one of the most exhilarating feelings in this world. We have but to thank 3 Brunswick Billiards employees for giving us this most exciting sport. This game was invented in 1972 by a group of Brunswick engineers Phil Crossman, Bob Kendrick and Brad Baldwin, when they all decided to work on creating a game using a friction less surface. 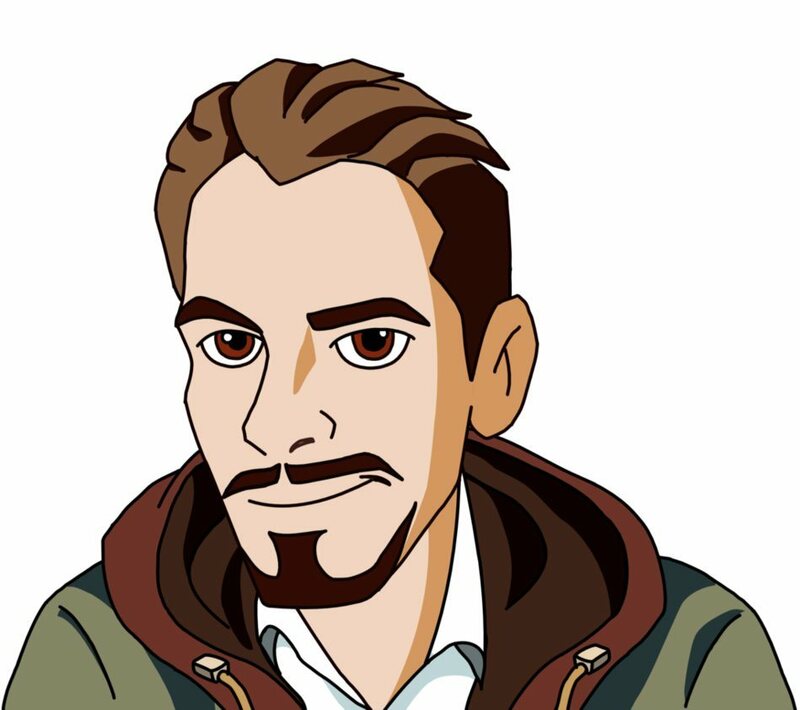 This project could almost be compared to the Face book story when in the story arrived a Mark Zuckerberg type of character by the name of Bob Lemieux who took their initial plan and created a more abstracted version. 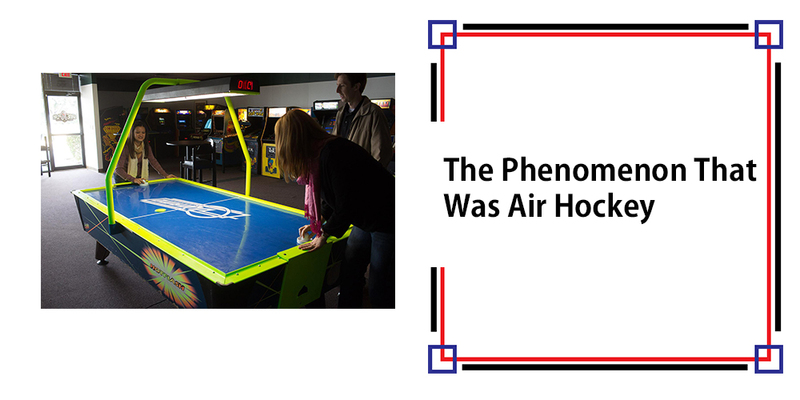 It is this version that heralded the birth of the modern day air hockey, as we know today. A thin disk, two strikers and slit-like goals equipped with photo-detectors was envisioned and implemented. It was only after this addition that the game was decided to be marketed to the general public. No one could have anticipated the kind of success Air Hockey was to see, as in an era dominated by football, baseball and other major sports; no one could have thought a small disk could slice its way through into the table of competitive sport. The game was an immediate success in the early 70’s with it becoming the main source of attraction in clubs, bars and arcades. It had every age group hooked on. From 8 year old’s to 68 year old’s; enter any place of entertainment and you would see a small huddle around a table cheering on their players. However, Air Hockey’s destiny was not to be limited to just these places, tweaking its way through clubs and arcades, it rose to achieve a competitive status- a place at the high table. The year was 1973 when the Houston Air Hockey Association was formed and 2 years later, the Air Table Hockey Association established rules for this game. Now that this sport had achieved competitive status, the big daddy's formed the rules now and Brunswick Corporation’s rules now became redundant, giving power to the hands of the people, quite literally. After its formulation, the United States Air Table Hockey Association has organized at least one national-level or World Championship every year, crowing 12 champions over a long journey of 30 years. In March 2015, The Air Hockey Players Association came into existence, a body that serves as an additional body overseeing the modalities of this sport. Even though both these associations run independently of one another, they embody the same spirit of the game and even host some of the same players. In July 2015, the AHPA crowned not only its first world champion but also the youngest this sport has even seen in the form of Colin Cummings of Beaumont, TX. The only tables that are allowed for tournament play are 8-foot tables. The approved tables include Gold Standard Games 8-foot tables, tables from Dynamo and the original 8-foot Brunswick style tables. Other tables that have flashy lights on the field of play are strictly prohibited from the professional side of this sport, allowing its use for entertainment and learning purposes. There are huge player bases around Houston, San Francisco, Sacramento, Los Angeles, San Diego, Denver, Chicago, New York and Boston in the United States of America, Barcelona in Spain, St. Petersburg and Moscow in Russia and Czech Republic. The first player to get 7 points wins the game. When the puck enters the opponent’s goal, the player receives one point. After each set or game, players change table-sides. The players who has been scored upon receives the puck to start the next serve. A player can serve the puck only after it has entered his/her goal. The puck can be struck with any part of the disk. The puck cannot be stopped by putting the disk over the puck. This cannot be done at any time during play. A player has 7 seconds to shoot the puck. This timer begins as soon as the puck enters the player's side. “Palming” implies that if any part of the player's body, arm or clothes touches the puck, it constitutes a foul. Each player can take one 10-second time out per game. He/she can only take the timeout when the ball is in his/her possession. When a player has been scored upon, he/she has 10 seconds to put the puck back into play. Alas! Air Hockey’s history was eaten away by the burst of technology. It’s fan following ended almost as abruptly as it had started. Pac-man and Space-Invaders crept into every child’s imagination, slowly diffusing the flashy light that Air Hockey had kept going for so long. Slowly, from entertaining people belonging to every age group, its importance slowly evaporated, only to re-surface occasionally at underground spots. What also worked against Air Hockey’s revival was the impracticality of the game. After the dust of novelty had cleared, people were hit with the realization that apart from a few moments of true virtuosity, this game was more like panicked bumbling. The main contention was that the puck travelled much faster than the eye could follow. What inadvertently happens is in your frantic attempt to hit the puck as far away from you as possible, the puck ends up in your own goal. Nevertheless, this game has entertained many and will continue to do so. For it peaked at a time that people couldn’t think beyond football and baseball and was an example of true innovation. So even if the Brunswick engineers failed to extend the life of this sport, it has brought people together from different walks of life and for that, they can definitely take a bow.